This post originally appeared at the University of Hull’s Remember Me project blog. Every July since 1996, one year since the Army of the Bosnian Serb Republic began the organised killing of 8,000 Bosniak men and boys in Srebrenica on 11 July 1995, women from the feminist, anti-nationalist campaign group Women in Black have stood silently in the centre of Belgrade to force Serbian passers-by to remember that the genocide occurred. In 1996, Slobodan Milošević – the president of Serbia who had armed, equipped and encouraged the Army of the Bosnian Serb Republic in its campaign to create a purely Serb nation-state (‘Republika Srpska’) and eliminate or expel non-Serbs – was still in power, soon to face a winter of public protest against his rule when he refused to recognise local election results. Milošević, in 2016, has been dead for ten years, and spent the last five years of his life in custody at the International Criminal Tribunal for the Former Yugoslavia (ICTY), which had charged him with war crimes across the conflicts in Croatia, Bosnia-Herzegovina and Kosovo, including responsibility for genocide against Bosniaks during the Bosnian war. Despite public hopes for a more democratic and less corrupt politics after Milošević fell from power in 2000, the elites who grew rich on the proceeds of the Yugoslav wars still exert political influence, and today’s Serbian government (led since 2014 by Aleksandar Vučić) continues not to recognise the Srebrenica atrocities as genocide. In July 2015, Vučić nevertheless attended the annual ceremony at the Srebrenica–Potočari Memorial Centre, a cemetery built in 2001–3 to bury the victims of the genocide, whose bodies continue to be discovered in new mass graves. Serbia, with Russian support, had prevented the United Nations adopting a resolution on the Srebrenica genocide in June, and the government had banned commemorations of the victims in Belgrade. A small group of mourners in the Potočari crowd threw stones at Vučić and, in 2016, he and other politicians from Serbia and the Republika Srpska entity of Bosnia were asked not to return. This year’s Women in Black vigil, named ‘Srebrenica 8372’ in recognition of the number of victims that forensic scientists from the International Commission for Missing Persons have been able to count, used the protestors’ silent presence – with a line of women at the centre of the protest holding the letters ‘SREBRENICA’ – asked the public to remember Serbian complicity in the genocide. 11 July 2008. Photo copyright Laura McLeod. Just as importantly, it called on the state to recognise the genocide officially, declare 11 July an annual day of commemoration and criminalise genocide denial. Their statement drew direct continuities between the ideology of Serbian nationalism and the ideology that motivated Serbian troops and political institutions to participate in the killing and expulsion of non-Serbs in Bosnia. New remains continue to be discovered and identified; another 127 victims were interred at Potočari this year. What most holds back investigators’ work and prevents survivors from finding out their disappeared relatives’ fate is not even the passage of time but the fact that, after the genocide, graves were disturbed and remains moved on an organised scale to stop the victims being identified and to wipe out evidence. Many of the people who must have ordered and carried out the removals are still alive but have not revealed what they know. Women in Black’s annual commemoration and political intervention takes what is now a well-established form but is far from a static ritual. Rather, as each new anniversary comes around, it has to be re-produced, in the face of threats and in response to a political context which changes on the surface but, the protest argues, never underneath. Their vigils’ message is supported by alternative media and other civic initiatives such as the Youth Initiative for Human Rights, which on 11 July lit candles outside the Serbian parliament building in front of a wall of photographs of the dead, and placed 8,372 numbered sheets of paper on the ground to visualise how many lives had been taken at the same time. The Srebrenica anniversary is Women in Black’s most prominent form of commemoration; after their Belgrade vigils, they also take part in commemorations at Srebrenica–Potočari itself. However, commemoration for Women in Black is a year-round process, and the group’s calendar of significant dates reveals a lot about how they perceive the causes of violence and war. In a list spanning January to December, Women in Black’s calendar of ‘Important Dates We Remember’ connects war crimes committed by Serbs in the 1990s with international struggles against patriarchy and militarism. On 27 February, they commemorate the far less well-known Štrpci massacre in 1993, when Serb paramilitaries abducted and killed 19 Bosniak and Croat passengers from a Belgrade–Bar train as it passed through the RS. They mark international days of action for human rights, women’s activism and disarmament, Europe Day on 9 May, Pride Day on 27 June, and an international day of struggle against the occupation of Palestine on 9 June, the anniversary of Israel’s offensive on the Golan Heights during the 1967 Six-Day War. Part of an international network of Women in Black groups, they take their name from the first group of Women in Black who – themselves inspired by earlier women’s vigil movements in South Africa and Argentina, and international feminist peace activism – started organising vigils in Israel in 1988 to protest against the occupation of Palestine. Founded in October 1991, when the Yugoslav National Army’s offensives in Croatia were at their height, the Serbian group protested every week in Belgrade until the end of the war in Bosnia. Resisting war and militarism, for Women in Black, is not just a matter of holding individuals accountable for crimes but also exposing and dismantling the structures that enable violence, from the state-directed violence of the Yugoslav wars to the everyday and intimate violence that still occurs on the street and inside the home. Success would come when commemoration becomes a mainstream political and social responsibility, not an act of protest. Introducing ‘The Yugoslav Wars of the 1990s’: why like this, why now? 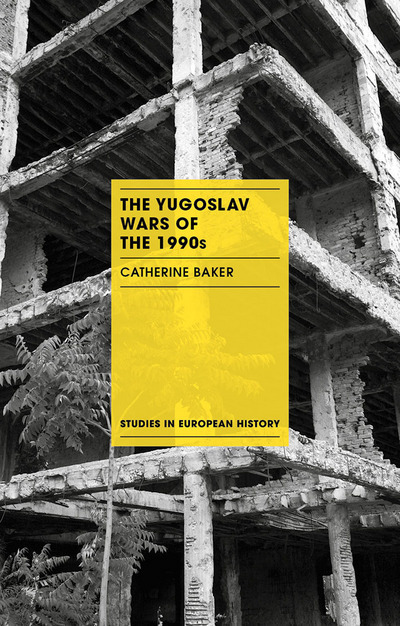 After a little bit more than two years of preparation, my introduction to The Yugoslav Wars of the 1990s is about to be available (at least in Europe, where it’s being published on 7 August; North America has a publication date of 21 August) – much more quickly than I’d originally expected when I submitted the manuscript in December 2014, but Palgrave were keen to make it available in time for the new academic year and with hard work from their editors and typesetters that’s what’s happened. Now in a bookshop near you! Or at least I hope so. I’ve written before on this blog about how I went about planning the book and what it contains, but now readers are about to be able to use it for themselves I ought to say something about what I hope the book will make it possible for people to do. It might be counter-intuitive in an introductory text, but for me the most important rationale of writing the book has been: make it a book that encourages people to read more books. I really hope this won’t be the one and only thing somebody reads – and I hope I’ve conveyed the importance of following up books that sound as if you’ll disagree with them, as well as books that sound as if they’ll confirm your point of view or your way of looking at the past. That said, there are people for whom it might be the first book on the Yugoslav wars that they read, or for whom it’ll be the first one with academic authority that they turn to in order to fill in the context behind what they’ve heard about the wars through news, entertainment or travel. This is a huge responsibility, but it’s the same one that I face multiple times a year along with anyone else who finds themselves structuring a course of learning: defining a subject of knowledge (what is there to be known about? what is and isn’t relevant? ), ordering that into a coherent structure so that readers or learners are progressing through something, and doing that in such a way that they’re able to articulate their concepts of the topic and what kinds of questions they can ask about it. Only this time, it’s scaled up. There’s also the question of who the hell am I to write this book – someone whose own specialist research has been on potentially tangential aspects of the wars and their aftermath (like national identity in popular music, or the international politics of the Eurovision Song Contest, or how peacekeeping forces get their translation and interpreting done). My research monographs haven’t been on questions of hard political and military fact that have to be established in determining individual guilt and responsibility, and I’m still earlier in my career than many of the people whose books are in the bibliography. (Yet I’ve been able to have the confidence that this book came about because the series asked me if I either knew anyone who could write the book or could do it myself, and I’d spent too long (ever since my first academic year of teaching in 2007-8) thinking about ‘what I’d want an intro text on the Yugoslav wars to do that no available book actually did’ to pass up the opportunity to try and tailor one to all the potential kinds of users that I was aware of. But then, the most difficult parts of the book have been where I need to steer the reader towards evidence about what can be stated as fact – for instance, the horrific forensic evidence from mass graves around Srebrenica, as painstakingly collected since 1996 by the International Commission on Missing Persons (and despite the efforts there have been to interfere with their work by trying to argue down the number of casualties or even disturbing the graves). There’s an awful lot of misinformation around: being able to understand how narratives and interpretations are made to compete with each other is one thing, but will the reader be better equipped to see through deliberate attempts to mislead after they’ve read this book? And another strength of the book is maybe that, of course, I don’t think the topics I’ve researched are marginal to understanding the Yugoslav wars at all – or rather, that I’ve been able to demonstrate they all have something to say about the much wider question of what is relevant to know about war, conflict and identity. Understanding how musicians, journalists and the public dealt with issues of national identity in popular music helps to show how far the struggles to redefine Croatian national identity during and after the Yugoslav wars reached into everyday life as well as the more obvious communicative sites of political speechmaking and the news. Suggesting why the national broadcaster of newly-independent Croatia was so intent on participating in the Eurovision Song Contest can help in understanding how people actually apply and create discourses of national and European identity and how these might have been transforming after the Cold War. Emphasising how dependent peacekeeping forces were on locally-recruited language intermediaries and how interpreters negotiated the aftermaths of war and the collapse of Yugoslav socialism reveals power relationships in wartime and post-conflict society that had been taken for granted even in earlier peacekeeping research. So the book has a chapter on ‘Culture and Languages During and After the Wars’ not just because rounding up the key debates on this topic automatically makes the book more useful in languages and literature departments (it does, though!) but because my position as a researcher has always been we can’t understand the full reach of the wartime politics of nationalism without going into these areas. There’s a chapter on ‘The Past on Trial’ not just so that the book might appeal more to scholars who are planning a comparative research project on transitional justice and need a quick introduction to the Yugoslav Wars (although that’s still a need I hope it meets), but because as someone who wants to understand the political lives of narratives, I can see (along with the historians whose very recent publications on the ICTY made this chapter possible) the contested findings and processes of the ICTY and national courts raise profound questions about the production of historical knowledge itself. I could fall back here on many historians (in social history, cultural history, gender history, global history…) who have striven to take the study of war beyond the battlefield and the negotiating table, or (to take one very recent statement of a position like this) on Christine Sylvester’s position in War and Experience that ‘war should be studied as a social institution’, the kind of thing that ’emerge[s] over time and dominate[s] alternative ways of living to such a degree that they seem normal and natural, or at least unavoidable’ (p.4): to paraphrase Sylvester’s list, it’s the myths and the narratives and the peacetime practices and the weapons research and the religious teachings and the popular cultural representations, as well as the troop movements and the consequences of combat. All this would be part of a whole layer of texts that space prevented me fitting into the introduction yet that have shaped how I wanted to approach writing the book – in other words, works that have shaped my understanding of what things are worth knowing about war. Nevertheless, the book has limitations, beyond the ones that I can re-cast as perverse strengths, such as the restricted word count – books in the series have a limit of 50,000 words, but then knowing I wouldn’t be able give an exhaustive account of any single aspect of the conflicts was counter-intuitively what made it feasible for me to think about writing it at all. I can’t cover the minutiae of any of the many disputes in the literature that there have been; the best I can do on that score is try to indicate where works have been in direct conflict with each other. In order to make the word count, I also cut back the long-term historical background by almost a half at a late stage, and compressed the complexity of a lot of my discussion of interpretations of the past before 1918, so that the rest of the chapters would fit. So there’s exciting new work on, for instance, nationalism, ethnicity, language and religion in the late Ottoman/late Habsburg period; or the politics of the first Yugoslav state between the World Wars; or on the history of socialist Yugoslav feminism and its implications for understanding women’s movements worldwide; that the reader isn’t going to get to hear about or where I haven’t been able to let the writing slow down and ask the reader to think about what these historians might be trying to do. No doubt it’s also going to dissatisfy specialists in other ways. Almost every sentence of the book relates to something that there are whole books about; I’ve had to condense arguments and pick out details while striking a balance between what existing publications have collectively constructed as important and what I can add in order to suggest how frameworks for understanding the wars could still expand. None of this is innocent or value-free work. I go back, again, to David Campbell’s 1998 review article ‘MetaBosnia‘, which compared how many of 32 events between 1990 and 1992 a number of published books on the Bosnian conflict had mentioned or left out. (And those 32 events were themselves the active selection of an author, of course.) Campbell suggested the deepest understanding of the past would have to come from reading multiple accounts, and I tend to agree even though it’s always possible to say (within the framework of the political and intellectual standards anyone has acquired) that some accounts are more comprehensive or rigorous than others. Nevertheless, part of understanding the past is seeing how disagreement about interpreting it works, and one has to look at multiple accounts in order to be able to do that. There’s a politics of knowledge behind everything I choose to mention or omit – when I say to myself ‘that has to be in there’ because the account would be incomprehensible without it, or it would simply feel unethical (except that ethics aren’t ‘simple’) to leave it out; when I say to myself ‘put this in because most accounts wouldn’t think to mention it and it will help to make this my book’; when I choose to take one recent publication as a worked example of how researchers try to create new historical interpretations from fresh evidence, rather than another; when I don’t even view something as relevant enough to add it to my notes at planning stage, or when I reluctantly decide one week from deadline that it’s just going to have to go. I’ve at least tried to be transparent about where and how I have simplified – though I could drill down into almost every sentence and show that something more ought to be there. The limitation I’m most conscious of, and where I still don’t think I’ve done a good enough job, comes from the politics of translation that have structured what work I was able to cite for an anglophone reader. If the reader can only be expected to have access to sources written in English, there are too many occasions where I could only cite an article or book chapter by someone whose book-length research published in Bosnian/Croatian/Serbian has been agenda-setting, and one or two occasions where the citation I needed wasn’t available in English translation yet at all. This isn’t good enough. In future I need to see what I can do to help make more research from the post-Yugoslav region available in translation – I’ve brought this up as a problem for years when writing book reviews, but maybe I’m getting to be in a structural position where I could help change that. I didn’t centre the untranslated work enough in this one, and I think I got it wrong. All that said, it still offers something that other books don’t – beyond, hopefully, what comes simply from having been written now, rather than in the late 1990s or immediately after the Kosovo War. (Although there is that too.) It shows how the contestation involved in historical research and representation is woven together with the very act of trying to be able to say something of what happened in the past; and using an authorial voice which is sometimes openly uncertain with the reader about how best to approach something still feels relatively unusual for an intro text, which I think is something distinctive about the book as well. For instance, how radically can or should one try to ‘deconstruct’ the idea of ethnicity or ‘denationalise’ history when people who have been persecuted as ethnic subjects demand to be recognised on that same basis? I don’t think it has a simple answer – indeed in different publications I’ve gone about it different ways myself – and the book certainly hasn’t found one, but I hope it’s something that the reader will be able to close the book and think about. This ought to be leading up to a promotional message of ‘read the book’. But what I want to say is: read the book, and then read other books, and do things with the book, and recognise where limits of the book are (both the ones I’ve told you about and the ones that I was still too close to it to see). Don’t let me have the final word for you. All right. Now read the book. The Yugoslav Wars of the 1990s will be very different to my previous two books (a research monograph on popular music and struggles over national identity in post-Yugoslav Croatia, and a co-authored monograph on translation/interpreting and peacekeeping during and after the war in Bosnia-Herzegovina). Firstly, it’ll be going straight into paperback, meaning there’s a good chance more of its potential readers will actually read it. Secondly, it puts me in a very different relationship to its subject matter; Sounds of the Borderland and Interpreting the Peace were both the result of multi-year research projects after which I was the only person (or with Interpreting the Peace part of the only team) to have been able to write those books that way. With this book, on the other hand, several dozen scholars would have the subject knowledge to be able to write a book fitting the general remit I had when I began the project: a 50,000-word book aimed at a reader who is new to the topic and which fits into a series that puts ‘a strong emphasis on the different perspectives from which familiar events can be seen’. Why should I do this, then, rather than anyone else? In a post last year I talked about some of the micro-level decisions I was having to make while I was writing the book – choices, for instance, about organising events into a narrative, imposing an order on events by breaking them up into chapters and periods, making sure the reader can understand what’s at stake in essentialist or anti-essentialist representations of nationalism and ethnicity, and trying to make visible what truth claims are based on. I hope some of those thought processes will still be visible in the text (I wish I could have worked meta-commentary on my own narrativisation into the book in a much more structured way, but just didn’t have the word count to do it). I set myself three objectives at the beginning of the writing process, which I think I have fulfilled – though ultimately the people who read and (I hope) use the book will be the judges of that. First of all, I wanted it to help the reader understand research that is happening right now. The last few years have seen a new wave of archival studies about the core history of the wars, such as Josip Glaurdić’s The Hour of Europe: Western Powers and the Breakup of Yugoslavia or Robert Donia’s new biography of Radovan Karadžić, but also research that has been trying to expand the angles from which historians and other scholars might look at the wars (such as Bojan Bilić and Vesna Janković’s important edited volume, Resisting the Evil: (Post-)Yugoslav Anti-War Contention), not to mention work that takes a position on the longer-term human consequences of the wars and the collapse of Yugoslav socialism (for instance, Damir Arsenijević’s edited volume Unbribable Bosnia and Herzegovina: the Fight for the Commons, which was published earlier this year in response to the Bosnian ‘plenum’ protests of 2014). Another objective was for the writing to show the reader how scholars make interventions into fields of knowledge, by giving some examples of how authors have set out to reinterpret or reassess elements of the histories of the wars. And a third – which perhaps can’t be entirely disentangled from the second – is to make explicit to the reader that their own beliefs and values are going to form part of how they (or the authors of any of the books in the bibliography, or me) go about interpreting and evaluating the events. The last chapters (which are also informed by the teaching and research I’ve done in different disciplines) introduce ways in which the consequences of the conflicts have been researched and show how these research questions can feed back into understanding the 1990s: from debates over peacebuilding and reconciliation, through the prosecution of war crimes (an activity which has itself helped to shape historical knowledge about the recent past), into the cultural and linguistic legacies of the wars. The long-term chapter was almost the most challenging part of the book to write, and the one that’s changed most dramatically since the first draft of the text (where it was twice as long, and much more detailed bibliographically – but when the full draft of the book started pushing 75,000 words in September, I had to accept that the first chapter couldn’t stay that way without pushing out another chapter later on). I say ‘almost’ the most challenging part of the book because the most difficult – appropriately, perhaps – was the conclusion. Within 1,500 or so words – because the book length in this series just wouldn’t give me any space for war – I had both to sum up an account of the conflicts that I found most convincing and to show the reader the approach to historical narrative that the book had taken. At times I wasn’t sure if I’d even improved on David Campbell’s classic review article ‘MetaBosnia‘ from 1998, which compared how ten works written in the mid-1990s had presented 32 political events that took place between 1990 and 1992 in Bosnia-Herzegovina; I hadn’t even been able to get into Campbell’s level of detail, or the level of detail that (with quite a different philosophy of knowledge) Sabrina Ramet was able to employ in her 2005 book about academic interpretations of the wars. Moreover, as someone who aims to deconstruct notions of collective identity and narratives based on them, I need – like every other scholar in this area – to balance that against the responsibility of writing about real lives and deaths. On the night of 1 May 1991, four Croatian police officers drove into the village of Borovo Selo, near Vukovar in eastern Slavonia, apparently to exchange the Yugoslav flag for a flag of the Republic of Croatia above a barricade that had been set up earlier that day by a recently-formed Serb militia in the village. Two of the four were wounded and captured when the militia fired on them during the raid. The next day, sixty fellow officers from Vinkovci entered Borovo Selo by bus in order to rescue the two men and drove into a pre-planned ambush at the entrance to the village. In the attack that followed, twelve of the Croatian officers were killed and their bodies mutilated. Horrific photographs of the recovered bodies were shown on Croatian television. The Borovo Selo massacre amplified Croats’ fears of the rebellion against the Croatian authorities that had been growing in strength since the summer of 1990, when groups of Serbs had set up barricades across roads near Knin in another part of the country, Krajina. Armed incidents had already taken place: that Easter, a firefight in the Plitvice national park between Croatian police and rebels commanded by the Knin police chief, Milan Martic, had left one person dead on each side. The spread of violence into eastern Slavonia and the building of the Borovo Selo barricade Selo had come after the future Croatian defence minister, Gojko Susak, had fired rockets into Borovo Selo in what Laura Silber and Allan Little describe as ‘an unprovoked act of aggression’ against the local Serbs (The Death of Yugoslavia, p. 141). Fear of where the rebellion and the countermeasures against it might lead had been growing since the Krajina barricades and the Plitvice gun battle. Yet even then, the visceral horror of the images from Borovo Selo seemed to change what it was possible to publicly say in Croatia. Journalists referring to the Serbs as ‘terrorists’ or ‘Chetniks’ – the nickname of the Serb royalist army during the Second World War, which had also massacred non-Serbs – became routine. In the field that I research, the entertainment industry, it was after Borovo Selo that the Croatian broadcaster stopped showing Serb musicians, even those such as the pop singer Zdravko Colic who had been acceptable as late as April 1991. After Borovo Selo, automatic suspicion of Serbs as national enemies could much more easily become ingrained common sense. The video recorded on a smartphone in Woolwich a few minutes after the killing of Lee Rigby, a drummer in the Royal Regiment of Fusiliers, approaches the horror of the pictures from Borovo Selo. The hands of the man claiming responsibility for the attack are still covered in blood. Both force the viewer to imagine the brutality of the killing; both depict the murder of victims who were killed because they served their state. Both are far beyond what a reader could normally expect to see on the front page of a newspaper in a time of peace. Although many British newspapers used a still image from the recording on their front pages the day after the murder, The Guardian‘s use of the image was perhaps the most shocking. Filling the front page with the image, as The Guardian often does, the newspaper confronted readers with the photograph and a quotation from the alleged killer’s speech: ‘You people will never be safe.’ When taken up by a national newspaper, even more so by one that considers its editorial identity anti-racist, the words come perilously close to suggesting that a people – however this is going to be defined – is under immediate, planned attack, the same argument that has been put forward by the English Defence League since its formation in 2009. On the evening of the killing, a remark apparently originating with a Metropolitan Police source that the attackers had been ‘of Muslim appearance’ was repeated by the BBC’s political editor, Nick Robinson (a comment for which he subsequently apologised). The Home Secretary, Theresa May, referred to the killing as ‘an attack on everybody in the United Kingdom’. The combination of words, images and commentary circulating in the British media in the aftermath of Woolwich, laid over the public ‘common sense’ about terrorist threats in the UK that has been built up throughout the War on Terror and especially since the 7/7 attacks in London, risked turning what was known about the immediate events – the attackers had claimed to have carried out the killing ‘because Muslims are dying every day’ – into a conclusion of collective guilt: Muslims are to blame. As someone with very religious Muslim family members in this country I watch press coverage of events like these closely, and often with a fair amount of fear. My mum, though she is one of the ‘you people’ in Thursday’s headline, lives in fear that she will become one of the ‘you people’ of the EDL’s chants. In the five days after Woolwich, 71 hate crimes against Muslims were reported to UK police forces, including the attempted firebombing of a mosque in Grimsby (covered, like Hull, by the area of Humberside Police). A hotline operated by Faith Matters and the Tell MAMA Project has received reports of 201 incidents, ‘up from a daily average of four to six’. The EDL mobilised an unclear number of members – possibly 1,000, possibly more – to march through Westminster on Monday, easily outnumbering the anti-fascist counter-protestors who must now regroup before another far-right march from Woolwich to Lewisham on Saturday. Many things set the killing in Woolwich apart from the massacre in Borovo Selo. In the background to each event are very different histories of discrimination, settlement, and relative power relations within and around the states where they took place. Their short-term backgrounds are very different, too, with a number and severity of incidents in the locality of Borovo Selo before the massacre that had not, thankfully, occurred in Woolwich. The Borovo Selo massacre took place within an ethnopolitical conflict where different authorities were claiming state sovereignty over territory; the far-right appropriation of Woolwich is an expression of anti-immigrant racism. What connects them is a brutal killing, a horrific image, and what becomes more acceptable to say in public after the killing and the image become known. In an academic context I would use the idea of the ‘collectivisation’ of threat or even guilt to explain some of the reactions it was possible to hear as news about the killing in Woolwich spread, and the increase in talk about Serb ‘terrorists’ and ‘Chetniks’ after the murders in Borovo Selo. It’s a thought process where members of a collective group, in this case a majority, recognise a threat as directed against the whole majority and coming from the whole of the minority that the killers belonged to rather than the immediate group that carried out the killing – whether the members of the militia who planned the ambush in Borovo Selo or however many people will be found to have arranged the killing of Lee Rigby in Woolwich. And it is dangerous. I’ve seen people call for hanging, torture, extra-judicial killings, locking up/deporting all Muslims and attacks on mosques. These aren’t strangers on Twitter, but people I’ve grown up with: gone to school with, babysat for, and (in one case) kissed. Hearing accounts like these (which deserve to be heard in full, rather than explained in a voice like mine – which, since I’m white and not a Muslim, can’t personally express the same degree of fear) points to a responsibility on the part of those of us who are being told we are collectively under attack not to contribute to collectivising guilt or threat any further if we reject the frame. The louder and safer the voice, the greater the responsibility. Challenging hatred and the far right in the atmosphere that has become public with shocking speed since Woolwich seems a harder task, but also much more urgent, than it did before the Woolwich murder. Reading accounts of anti-fascist organising in Britain in the past, such as the Battle of Cable Street against the British Union of Fascists in 1936 or the resistance to the National Front in Lewisham in 1977, one wonders whether today’s movements would be able to organise similar numbers of people for action inherently more dangerous than the A-to-B marches that have characterised mainstream political protest in the 2000s and 2010s. At the same time, and just as urgently, we need to find ways to resist – and avoid replicating – the politics of collective guilt and threat that make direct violence more possible. A very Special Subject: where does my module on former Yugoslavia go next? The end of my last ‘Nationalism and Intervention in Former Yugoslavia’ seminar on Wednesday meant that I’m not going to be teaching again until the autumn. (I can’t quite say that I won’t be ‘in the classroom’ again until then, as there’s a round of presentations for another module to be assessed before that.) This doesn’t mean that teaching goes to the back of my mind for the next few months, then; far from it. There’s another new module to launch (on nations and nationalism in the contemporary world), and the former Yugoslavia module is being extended into a two-semester Special Subject, which has been on my mind more and more as the shorter version has been coming to an end. Reflecting on my classes has been a very different experience this year because I’ve known that they’ll be running in some shape or form again next time. Now, thinking through what worked and what didn’t isn’t just about assessing my personal effectiveness as a teacher, but also part of planning for the next cycle: what worked well, and what can’t I face ever basing a discussion around again? What activities really brought home the underlying themes of the session and what discussion questions just need to be taken outside and put out of their misery? What ideas did students unexpectedly bring up that would be good to add to the content so that future students can benefit from their insights too? Why did a certain fresh new topic in the literature spark no student interest at all? What new research has come out in the last year that I’d like to incorporate into the module, and will it change any of the activities I’m carrying over? It’s only recently that I’ve been able to think about modules in cyclical terms like this. Long-term thinking is a luxury of stable employment: before this year, I’d never taught on a module and known that I’d be doing it again next year. (The ‘Yugoslav wars of the 1990s’ module that I designed at Southampton did run twice, but I didn’t know that was going to happen when I taught the first iteration.) As a short-term impact, this ability to plan means that sessions that don’t go well are less upsetting , since I can at least use them as a starting point for planning what to do differently next time. Moreover, there’s the reduction in stress that has come from knowing where and how I can expect to be working and living next year, and from not having to devote an extra day per week to job applications on top of whatever my current work demands; it’s only now that I can recognise how much these kinds of uncertainty affected my teaching quality in 2010-11. Once the next month of marking is out of the way, then, my teaching focus will be on turning the current ‘former Yugoslavia’ module into a Special Subject. ‘Specials’ are a type of advanced module for final-year history undergraduates (the North American equivalent would be what’s known as a capstone course or senior seminar). Unlike most modules, they run over both semesters of the teaching year, and at Hull a student on a Special Subject will also write their dissertation on a linked topic of their choice that the module tutor is able to supervise. Firstly, then, the new module will be twice as long, and its natural break points will fall differently; secondly, the activities with first-hand sources need to be even more in-depth and extensive, so that students are ready to write a 10,000-word dissertation of their own. Why study the 1990s three times? The existing ‘former Yugoslavia’ module has an unusual structure. Knowing that it would take place in semester 2, and realising that the title concepts, ‘Nationalism’ and ‘Intervention’, lend themselves to a ‘part 1’ and ‘part 2’, I planned the first section on the politics and society of former Yugoslavia throughout the 20th century to last up until the Easter break, and the second section on foreign intervention and (former) Yugoslavia to kick in after Easter. Although I’ve used ‘intervention’ in the title, this second part actually concerns foreign contacts with the region in a much wider sense – military, humanitarian and diplomatic intervention, but also other less collective forms of travel, enabling me to bring in the literature on travel writing and ‘imagining the Balkans’ that has been so influential in the historiography. This means that students go over the 20th-century chronology twice. I haven’t done this before, and when I started the module I was anxious over whether it would work or whether it was just innovation for innovation’s sake. There’s a good reason for it, though: the post-Yugoslav wars in the 1990s have naturally had a huge impact on how researchers write about the region, even when their own focus is an earlier moment in time. The 1990s wars, and the Yugoslav background as a whole, are complex settings that students are unlikely to have studied before. If the module wasn’t going to cover the 1990s until April, how well would students be able to integrate them into their ‘scaffolding’ of what they know about the subject matter? Even though they come last chronologically, the conflicts in Croatia, Bosnia-Herzegovina and Kosovo are still ‘threshold concepts’ that belong at an early point in the module – not at the end of the module when I want students to be synthesising the main points of a semester’s worth of learning. And so we’ve ended up approaching the 1990s three times, to make sure that the threshold does get crossed. The introductory week to this module gives a sense of the main themes of the historiography, with strong signals from me that they’ll be able to understand it in more depth as they go on. The key readings for seminar discussion are a chapter from Misha Glenny’s The Fall of Yugoslavia about an early stage of the Croatian war of independence in Krajina and a chapter of V. P. Gagnon, Jr’s The Myth of Ethnic War on Croat/Serb relations – two authors who conceive of ethno-nationalist conflict in very different terms. (I could push the contrast further by switching Glenny out for a chapter of Robert Kaplan’s Balkan Ghosts, but I’d rather use Kaplan in a ‘Balkanism’ seminar, all things considered.) Awareness of these two perspectives helps students fit later readings into the ‘ethnic war’ debate, and the example of Krajina, or Gagnon’s work, have both recurred in later seminars – evidence that this first week has had some effect. Then the pre-Easter and post-Easter blocks each finish with the 1990s and their aftermath. Maybe I was never going to be satisfied with my 1990s coverage in a one-semester module – after all, I’ve taught an entire module about the 1990s in the past – but throughout the end of the first block, I was conscious of how much I was leaving out. The Croatia, Bosnia-Herzegovina and Kosovo conflicts need to be handled separately for their specificities to be appreciated, and B-H has got referred to in seminars much more than either of the others, no doubt partly because that week’s document exercise concerned a Bosnian town. The final session of the block, rounding up literature on the socio-cultural effects of the war, also pulled in two very different directions; I’d have liked to have one seminar for both topics that emerged, but this has implications for the timetable in an option that has two seminar groups. Spreading the module over two semesters will let me expand the obvious ‘problem’ topics. Croatia, B-H and Kosovo in the 1990s can all have a week to themselves, and the moment in the ‘intervention’ block where I did have two different topics for the seminars (one on the Hague Tribunal and one on motivations for foreign intervention in the 90s) can give each topic its full weight without students needing to attend two different seminars if they want to engage with them both. My experience with the final week of this module – another experiment – has also been encouraging and is giving me ideas for things that I can do next year. There isn’t a final exam, because the module is assessed by two different types of essays (one focused on a topic from a particular period and session, and one ‘synoptic’ essay where students must pursue a particular theme across the full sweep of the c20 – this avoids ‘cherry-picking’ a favourite period within the module). The traditional end-of-module revision session, then, would be a waste of time. Instead, I asked students to read one of a selection of theoretical or comparative articles that make a significant contribution about one of the concepts we often explore during the module but that aren’t primarily about former Yugoslavia: in seminar discussion they had to summarise its main points to students who hadn’t read it and offer suggestions for how the article’s findings might apply to (or sometimes, not be relevant to) the former Yugoslav case. I offered a selection of eight articles, all of which had some relation to one or more of the synoptic topics, and trailed the session as an exercise in lateral thinking that would help students identify ideas they could develop further in their synoptic essays. This ‘breakout’ session is the one that most worried me before I delivered it, especially as attendance had dropped in the previous couple of weeks: would anyone come? And would they see the point? As it happened, attendance was better than it had been for several weeks, and everyone had something to say about their chosen article – for instance, being able to relate Rogers Brubaker’s argument in his ‘Ethnicity without groups’ article (pdf) to Gagnon’s constructivist perspective on the idea of ‘ethnic war’. My experience with the final week of this module gives me confidence in using that material in the Special Subject. I could include a week on competing academic approaches to nationalism, cover the idea of ‘Balkanism’ and its relationship to ‘Orientalism’ in more depth, or look at the so-called ‘liberal peace’ in a wider context than we were able to do this time. But then I also need to create space for ‘sources and methods’ work to support the dissertation, and to work out where this would be best placed in order for students to be prepared for what they need to do. Showing that dissertations on the module topic were feasible was an important part of justifying a module on this topic at this level, especially since the Special Subject and dissertation supervision are linked (which isn’t the case everywhere). I’m not in a language-based area studies department, so there need to be enough primary sources available in English to make a good range of dissertation topics feasible. The sources also need to be accessible from Hull: I don’t want to design a module theme that forces students to travel to London archives if they want to do well, since it would be an unfair requirement to impose.These considerations, plus the fact that I’ve researched international intervention in Bosnia, were why I designed the module from the outset around the foreign intervention aspect as well as the internal history of Yugoslavia: it makes a much wider range of English-language sources relevant, as well as tying one of the most important developments in post-Cold War south-east European studies (the ‘Balkanism’ debate) into the module. Luckily, digitised document collections make the possibilities for non-London-dependent student research much greater than they would have been when I was an undergraduate: besides digital access to records of UK and US parliamentary debates, the Hague Tribunal has placed transcripts of its hearings online; the Open Society Archives have digitised thousands of Radio Free Europe/Radio Liberty situation reports; there are the declassified documents from the CIA; through JISC, we have access to the US Foreign Broadcasts Information Service and – something I’m particularly excited about – the JISC MediaHub, with relevant news footage from sources including Gaumont, ITN, Channel 4 News and Reuters; there’s a large video archive of oral history interviews about the siege of Sarajevo, which I need to have a look at; Project Gutenberg‘s collection of out-of-US-copyright works helps with access to travel writing and memoirs from the 1920s and earlier; on the off-chance a student wanted to explore the historiography around music and politics in former Yugoslavia (one of my own research areas), there’d even be my own collection of 300+ lyrics in translation – if I can ever improve the usability. Our university library turned out to have a surprising number of Yugoslav pamphlets from the Tito era translated into English, I have enough in my library budget to substantially increase its collection of memoirs, and the Hull History Centre has papers belonging to British socialists who were interested in Tito’s Yugoslavia which could provide a basis for dissertations on Yugoslav Communism and the British Left. All of these need methodological support, advice on search strategies, and opportunities for practice if students are going to be able to use them in a historically informed way. Should musicians be liable for incitement to genocide? The charges of inciting ethnic violence laid against three Kikuyu singers this month by Kenya’s National Cohesion and Integration Commission represent the latest attempt to extend the reach of post-conflict justice beyond physical perpetrators – by holding musicians and music broadcasters responsible for their complicity in ethnopolitical conflict. National and international lawyers dealing with the aftermath of the 2007–08 post-electoral conflict in Kenya are following the precedent of the International Criminal Tribunal for Rwanda (ICTR) which, at the trial of Simon Bikindi in 2006–2008, became the first war crimes tribunal to indict a musician for incitement to genocide. Bikindi’s songs calling for Hutu solidarity against Tutsis had been repeatedly played before and during the genocide in 1994 by the broadcaster Radio Télévision Libre des Mille Collines (RTLM). Earlier cases at the ICTR had convicted RTLM speech broadcasters of incitement (an approach the International Criminal Court has extended to Kenya by indicting the radio broadcaster Joshua arap Sang in 2011), and the prosecution at the Bikindi trial argued that a musician could be held liable on the same basis. The evidence of his songs alone and texts recorded before the genocide was not enough for the ICTR to convict Bikindi of incitement (judgement, PDF). Convicting him on the basis of his lyrics would have required the prosecution to prove that Bikindi shared the intent of the génocidaires when he composed the songs and that to avoid liability after the violence began he should have asked RTLM to stop playing his music (see Snyder 2006). However ,his conviction for incitement rested instead on an incident where he had broadcast a speech calling for violence from his car. Legal scholars have offered several sets of extended criteria for proving incitement in the wake of Bikindi in support of the notion that songs can be considered actionable speech. Did the speaker – or the performer – use dehumanising rhetoric during or soon after acts of violence against the target group? What channels of communication were used and how responsible was the performer for the dissemination of the speech or song? Though musicians have been put on trial for their songs under many regimes (see Côté 2011, £), subjecting the creative work of musicians to criminal responsibility within a transitional justice framework is an innovation of the ICTR. Transitional justice after the Yugoslav wars, in contrast, has not attempted to cover the behaviour of musicians. There is strong evidence that media played a significant role in disseminating ethnonationalist discourses before, during, and after the wars and that popular music was implicated in this framework. However, the International Criminal Tribunal for Former Yugoslavia, preparing its indictments from the mid-1990s onwards, has not tried to assign responsibility for ethnic cleansing to musicians or to put media executives on trial. Music in the post-Yugoslav conflicts was, nonetheless, used as a tool in ethnopolitical conflict. Many prisoner testimonies record the forced singing of ethnonationally marked songs as a torture technique (for which the torturers, not the creators of the songs, are liable), and music playing was used to harass enemy troops during breaks from combat. States and armed forces used music and its celebrities, performing at front lines, as an asset to improve troop morale: Croatian forces, for instance, militarised civilian musicians into ‘artistic units’ in autumn 1991, legally rendering them combatants for the duration of their service. On a more general level, attempting to break apart the common entertainment industry of the former state through legal, financial and discursive means achieved, or aimed to achieve, a conceptual separation of ethnonational groups through altering the everyday musical landscape. All these methods contributed to the aims of ethnopolitical conflict by acting on military and civilian morale and by hardening the boundaries of groups. The patriotic discographies of all sides in the post-Yugoslav conflicts contain songs that could be compared to the repertoire at issue in Bikindi. The ICTR has held songs recorded in advance as insufficient for incitement, but live performances of them in proximity to acts of violence might be. Developing this standard would require a jurisprudence of what messages were and were not actionable. Is the call to push the enemy out of one’s own country defensive, legitimate and exempt? What if the singer promises instead, as in one well-known Croatian wartime song, that ‘our hand will reach you even in Serbia’? Could behaviour outside the text, such as the display of flags or salutes with specific connotations during a performance in proximity to an act of violence, create liability even if the words of the song might not? Comparing the ICTY and ICTR approaches leads us to ask whether the work of transitional justice in former Yugoslavia would have been improved if it had exposed the complicity of musicians and criminalised what performers, and many of their audience, would regard as their wartime patriotic engagement in support and defence of their own ethnic group. The politics of music after the Yugoslav wars suggest that bringing musicians into the remit of transitional justice would in fact have been more divisive, and not conducive to post-conflict reconstruction. Discourses of music as a weapon of war were widespread during and after the Yugoslav wars, in all belligerent entities. The dominant discourse read the use of music by one’s own group as within the bounds of the normal, and simultaneously concluded that the musicians of the “other”, who had behaved in parallel, were personally implicated in aggression. On the Croatian side, for instance, the Serbian pop-folk singer Nada Topčagić continues to be held responsible for performing patriotic songs to Serb soldiers and civilians at a concert in occupied Vukovar in 1992; veterans’ groups in Croatia and Bosnia-Herzegovina in 2009–10 similarly objected to the first performances by Lepa Brena in their countries after the war because they understood her to have worn a Bosnian Serb uniform while visiting Brčko in 1994. The idea that the “other” had used music as a weapon of war served, after the conflict, as a reason why the music of the “other” was not acceptable for performance or hearing within the nation-state. This logic, in fact, continued the fixing and separation of ethnic boundaries. The discourse was applied not just to artists whose complicity could be proved, but on a collective basis: when used in Croatia against music from Serbia, for instance, it caught up even with Belgrade’s anti-war alternative rock musicians, some of the least likely people in the country to have taken part in violence. The head of the Croatian Musicians’ Union in the mid-1990s, whose policy was to impede Croatian–Serbian musical collaboration, became a figure of fun in the left-wing Croatian press after stating that ‘nobody can guarantee that some of those musicians weren’t mobilised and might not have been shooting Vukovar up’ (Feral tribune, 17 April 1995). The discourse that the “other’s” musicians were collectively complicit in the war interfered with – though did not completely prevent – the re-coalescence of a common, through fragmented, cultural space. Music is clearly significant in ethnopolitical conflict; yet viewing it solely through a legal lens has drawbacks. State media systems, in the post-Yugoslav states and elsewhere, incorporated musicians as a professional group into patriotic initiatives that expressed the dominant, ethnocentric narrative of the conflict: but to accuse all musicians of professional complicity loses sense of the multiple reasons, including the idea of a pluralistic national defence, why musicians took part in them. Any ‘benevolent censorship’ of ethnocentric music brings with it irreconcilable problems of the power to define what is illegitimate and whom it is applied against. And the idea of indicting musicians for incitement for patriotic music risks producing a net that would extend, in cases such as the Yugoslav wars, to the majority of a state’s professional musicians. The potential damage to shared cultural and everyday connections between groups and states – which must surely be a necessary part of post-conflict reconciliation – is clear. The work of musicians may legally be an object of interest for transitional justice. That is not to say it should systematically be so. This post originally appeared at Justice in Conflict and is based on conclusions in an article under review by Patterns of Prejudice. On media in general, see V. P. Gagnon, Jr, The Myth of Ethnic War: Serbia and Croatia in the 1990s (Cornell University Press, 2004); Dubravka Žarkov, The Body of War: Media, Ethnicity and Gender in the Break-Up of Yugoslavia (Duke University Press, 2007). On music, see Eric D Gordy, The Culture of Power in Serbia: Nationalism and the Destruction of Alternatives (Pennsylvania State University Press, 1999), Ivan Čolović, The Politics of Symbol in Serbia (Hurst, 2002) and my Sounds of the Borderland: Popular Music, War and Nationalism in Croatia since 1991 (Ashgate, 2010). Don’t forget, and face the shadow: what has Eurovision got to do with remembering the dead?